Under a new Education Ministry rating system, Lyceum №1535 in Moscow has been rated as the best school in Russia, having the country’s best results for the 2012-2013 academic year. On entering, the song “Ya na solnyshke lezhu... Ya na solnyshke lezhu” (“I'm lying in the sun”) is heard immediately, from the famous cartoon about the lion who was over the moon because of all his laziness. This is the bell that notifies students of their break: It reflects the overall mood of those whose classes have finally ended. “I think that it's just the way it was meant to be,” says the school’s principal, Tatiana Vorobieva, when asked what the school’s secret it. “In 1990, the Institute of Asian and African Studies and the teaching staff of Boarding School №14 came up with the idea of creating such a lyceum with an advanced curriculum in the Chinese language. It was decided to open a lyceum that would give students a choice. And so they did. At first, only two experimental classes were set up. In those two classes, children were able to spend more time studying the subjects they found especially interesting — the subjects of their personal choice. In 1991, the boarding school was reorganized into a lyceum. Students from all over Moscow came to be enrolled, but only those who passed an entrance exam were admitted. Two experimental classes grew into a lyceum with 38 classes, 7 specialties and 1,080 students who can pick any specialty they want — just ordinary teachers and ordinary kids. Right along the school hallway there are soft, low couches. The students sprawl out on them anyway they want—sideways, with their feet up, whatever they prefer. Two girls from the 9B class are sitting on it with their arms around each other. Lyceum №1535 cooperates with universities, and the seven specialties that any student can chose were created for collaboration with different university departments. The history/philology and socio-economic specialties both teach students what they will need in order to study at the Institute of Asian and African studies at Moscow State University. Subjects from the social and humanitarian specialties are chosen so that children are able to study law, social sciences, or politics. And so on. New specialties are not uncommon, since the school adapts to the outside world where its young scholars will study. Varya and Asya study in class with a humanities specialty. They have their favorite teachers: the literature teacher, the history teacher...and, among the physics teachers, Andrei Hotuncev. Hotuncev's class is empty, everyone has finished studying, but only two voices can be heard: Hotuncev is discussing the battle of Kulikovo with one of his students. Yet the physics teacher hints that a student's main life lies outside of the school. He has been working in this lyceum since its opening. There is another way in which they lyceum differs from other schools. 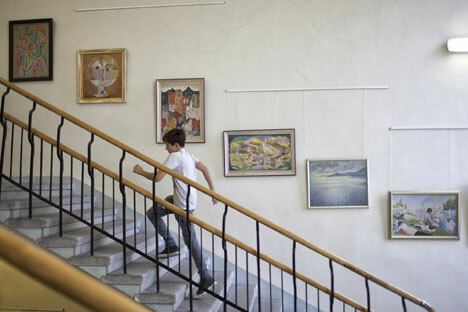 During world art classes, students visit museums and do not just look at pictures on a projector. It sounds very simple, but there are not many schools in which this is done regularly. Teachers say that everything depends on how schools react to different rules. If they are scared to violate something and if everything stated in ministerial documents is forbidden, then that school is dead. If the directorate understands that these rules are merely a recommendation for unrestricted work, then the school can actually breathe. Only in the space between rules can a life exist and evolve. Why is everything the way it is at Lyceum №1535? Is it because of the professional people or because of the organization? “It's like the chicken and the egg!” Varya exclaims. Asya agrees.